This crash with injuries in October happened at U.S. Highway 160 and River Road, an intersection that has been identified as one of the more dangerous in Durango. The Durango Police Department recently released a list of the citys top 10 accident hot spots for 2010, and along with increased enforcement, some changes could come to these notorious intersections. Traffic Officer Rob Haukeness said the Walmart area, ranking No. 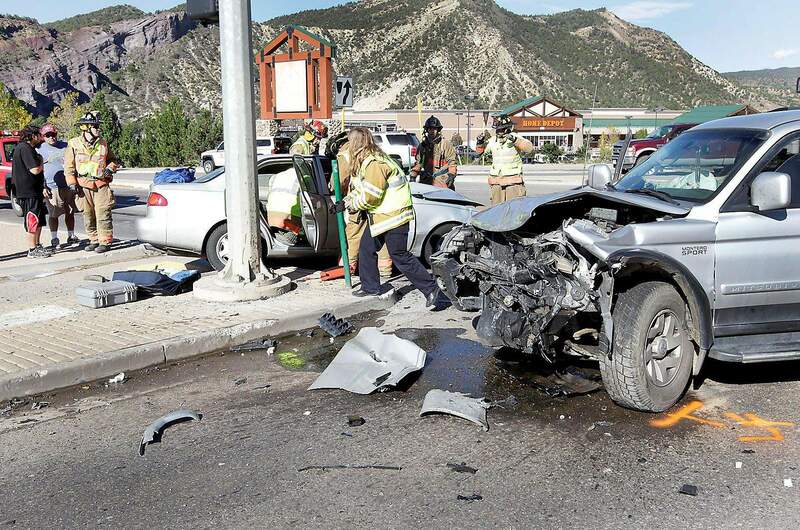 1 with 51 accidents, is home to the most dangerous intersection in Durango at U.S. Highway 550 and Dominguez Drive. There is not a stop arrow to prohibit drivers on the highway from turning left in front of oncoming traffic, Haukeness said. Its a 50-mile-per-hour zone, and a lot of people are driving 65-miles-per-hour-plus, he said. Turning drivers misjudge the distance between themselves and oncoming traffic, Haukeness said, and oncoming traffic often is speeding. Parsons said to improve the Walmart intersection, the Colorado Department of Transportation needs to change the light so drivers cant turn left across approaching traffic, but the two agencies havent discussed it yet. Haukeness said the same problem is responsible for accidents at intersections near the Durango Mall and Home Depot, which ranked as the citys third- and fifth-most-dangerous locations, respectively. Ranking No. 2, with 38 accidents, was the area encompassing Durango High School, the La Plata County Fairgrounds and the Durango Community Recreation Center on Main Avenue between 24th and 27th streets. Haukeness said the majority of these accidents are speed-related and often involve drivers running stoplights or turning in front of oncoming traffic while students, parents and DHS employees rush to get to school. Most accidents at Main Avenue and 32nd Street, ranked No. 4, and College Drive and Camino del Rio, ranked No. 8, also are caused by drivers pushing the light, Haukeness said. The DPD has a no-tolerance policy when it comes to running red lights, Parsons said. Nine of the 10 locations on the list are along the U.S. Highway 550 corridor. Its a wide-open, four-lane highway, and people are speeding, and thats what it boils down to, Haukeness said. The hot spot not near Highway 550 is the Florida Road-North College Drive intersection, ranked No. 7 and currently under reconstruction. City Manager Ron LeBlanc said there will be a traffic signal installed at that intersection to help remedy the high accident count. LeBlanc said he was not surprised by the locations on the list. The list, he said, highlights the need for ongoing improvements, which will involve not only the city but the county and state as well. Durango Police Chief David Felice said officers will do what they can to mitigate the hot spots through their visible presence and increased enforcement. The majority of the accidents on the list are a result of poor driving, Felice said. In 2010, the DPD completed 936 motor-vehicle accident investigations, as well as 271 hit-and-run investigations and 171 private property accident investigations. This is the first year the DPD compiled a detailed report about accident numbers and locations, Parsons said. A new records-management system enabled the DPD to compile the information.